When you're looking for an amazing and stylish minivan you and the whole family can enjoy, consider the 2016 Nissan Quest your top priority. The 2016 Nissan Quest has plenty of space and is committed to safety. At Premier Nissan of Metairie, you'll have the opportunity to purchase the 2016 Nissan Quest for an amazing price. Premier Nissan of Metairie is located at 6636 Veterans Memorial Blvd. in Metairie, LA and serves the following cities: New Orleans, Gretna, Laplace, Mandeville, and Harvey, LA. 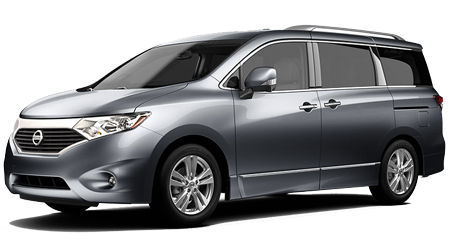 2016 Nissan Quest has a starting MSRP of $26,530. The MPG rating on the Quest is 20 city / 27 hwy. The 2016 Nissan Quest has plenty of features with innovative technology offered on all models. Some of the features you'll love include rear bumper protector, roof rail crossbars, and a hatch tent. There are four models to select from: S, SV, SL, and Platinum. You have a selection of exterior colors to choose including brilliant silver, gun metallic, pearl white, super black, and titanium. The interior color features a gray cloth. The 2016 Nissan Quest comes equipped with a 260HP 3.5L V6 engine. Features include 16" aluminum-alloy wheels, dual sliding rear doors, power outside mirrors, front UV-reducing solar glass, and chrome door handles. Interior features on the 2016 Nissan Quest include Nissan Intelligent Key with push-button ignition, air conditioning, in-cabin charcoal microfilter, 2nd/3rd row air conditioning/heater vents, power door locks/ windows, power 2nd-row side windows, tilt and telescoping steering column, cruise control with illuminated steering wheel-mounted switches, variable intermittent speed-sensitive flat-blade windshield wipers and intermittent rear wiper, dual front map lights, dual second / third row reading lights, cargo area light, sun visors with illuminated vanity mirrors and extensions, sunglasses storage, mood lighting, two 12-volt DC power outlet, retained accessory power and battery saver, removable second-row center console with cup holders and DVD storage, 1st/3rd seatback grocery bag hooks, and permanent rear storage well. Audio and Entertainment features include an AM/FM/CD audio system, auxiliary audio input jack, and four speakers . The trim on the 2016 Nissan Quest include 6-way manual driver's seat, 2nd-row captain's chairs with 3rd-row easy-entry feature, fold-flat 2nd Ðrow captain's chair, 3rd-row 60/40 split fold-flat bench seat, cloth, trim, wood-tone trim on dashboard and front door panels, locking glove box, front/rear door storage pockets, four high-capacity coat hangers, and sixteen cup/ bottle holders. When you purchase a premium 2016 Nissan Quest, you're obtaining more power, luxury, and efficiency. Standard features include 18" aluminum-wheels, smart auto headlights, high intensity discharge xenon headlights, fog lights, one-touch power sliding doors with auto-reverse feature, one-touch power liftgate, roof rails, optional dual opening glass moonroof, power outside mirrors with turn signal indicators, heated outside mirrors, automatic tilt-in-reverse outside mirrors, front UV-reducing solar glass, rear privacy glass, chrome-accented grille and chrome license plate finisher, and side sill spoilers with chrome accents. Interior characteristics of the premium models include Nissan Quest an 8" touch-screen monitor with navigation and voice recognition, around view monitor, Nissan intelligent key, Bluetooth, home link universal transceiver, Auto-dimming interior rearview mirror, digital compass, tri-zone automatic temperature control, advanced climate control system in-cabin polyphenol micro filter, power front-passenger window with one-touch auto up/down and heated seats. Audio and entertainment features include Bose audio system with AM/FM/CD with 13 speakers, DVD entertainment system with 8" color in-dash monitor, dual media playback, two wireless headsets and remote control, speed-sensitive volume control, Bluetooth, and illuminated steering wheel-mounted audio controls. The trim on the premium Nissan Quest models include 8-way power driver's seat with center armrest, 4-way power front passenger's seat, driver's seat power lumbar support, driver's memory seat and mirror system Quick Comfort heated front seats, quick release third-row folding seatbacks, power-return third-row seats, leather-appointed seats and door trim, leather-wrapped steering wheel/ shift knob, and wood-tone trim on sliding door panels. Standard safety features in the 2016 Nissan Quest include Nissan advanced air bag system with dual-stage supplemental airbags, driver and front passenger front/side airbags, roof-mounted curtain side-impact supplemental airbags, vehicle dynamic control with traction control system, blind spot warning, rear cross traffic alert, optional predictive forward collision warning, optional forward emergency braking, 3-point ALR/ELR seat belt system, front seat belts with pretensions and load limiters, lower anchors and tethers for children, zone body construction with front/rear crumple zones, hood buckling creases and safety stops, Pipe-style steel side-door guard beams energy-absorbing steering column, and a tire pressure monitoring system with easy-fill tire alert. You can count on Nissan for having amazing safety measures on their cars! When it comes to an amazing crossover large vehicle, come test drive the 2016 Nissan Quest today! At Premier Nissan of Metairie, you'll have excellent customer services and financial options available! Let Premier Nissan of Metairie help you find the perfect 2016 Quest today! Premier Nissan of Metairie is located at 6636 Veterans Memorial Blvd. in Metairie, LA and serves the following cities: New Orleans, Gretna, Laplace, Mandeville, and Harvey, LA.